The Bahrain Center for Human Rights (BCHR) and Gulf Centre for Human Rights (GCHR) express their concern over the harassment and ill-treatment of leading human rights defender Nabeel Rajab and his family at the hands of the authorities at Heathrow Airport. On 24 July 2014, Nabeel Rajab, president of BCHR and director of GCHR, arrived with his wife and two children (12 and 16 years old) at Heathrow International Airport from Bahrain on a personal visit to see friends and undergo medical checkups in the UK. To their surprise, they were held for approximately five hours at a temporary detention center at the airport as they were waiting for the immigration authorities to process their entry papers. Their luggage was thoroughly searched and their fingerprints and photos were taken. They felt that they were treated “like criminals”. Rajab was allowed one phone call only and had to be escorted by a policeman when going to the rest room. Additionally, he was interrogated about his sentence and imprisonment in Bahrain, which was the apparent reason for this treatment. Later, they were informed that they would be allowed to enter the country; however, their passports were held for investigation and they were told that they will be notified in two weeks (by August 7, 2014) whether they will be allowed to stay in the UK for three weeks as they had planned. Rajab’s visa was issued via the UK embassy in Bahrain a few days before his trip and no issues were brought to his attention at that time. 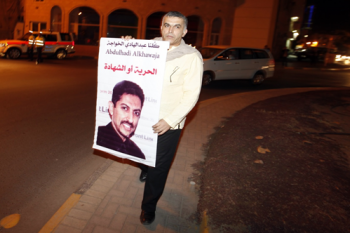 Rajab was imprisoned in Bahrain for two years between July 2012 and May 2014 for exercising his right to freedom of assembly by participating in and calling for peaceful protests, in the Capital Manama, in defense of people’s rights in Bahrain. He was considered a prisoner of conscience by several human rights bodies including the UK based Amnesty International, and his detention was considered arbitrary by the United Nations (UN) Working Group on Arbitrary Detention. In June 2014, the UK embassy in Bahrain held his passport for over 16 days after he submitted it to apply for a UK visa, despite the fact that the normal visa procedure does not take more than 5 days. The embassy also delayed handing back the passport after he asked for it even if without a visa. Eventually he was handed back the passport with a visa that was issued then canceled. As a result of this delay, the embassy effectively managed to hinder the human rights defender’s planned activities to travel to the UN human rights council (HRC) 26th session in Geneva, as a meeting organized between Rajab and the OHCHR was cancelled after initial postponement, and his participation in several planned events on the side of the UN HRC, which were announced publicly were also cancelled, due to the fact that he was not able to travel while his passport was held at the embassy.